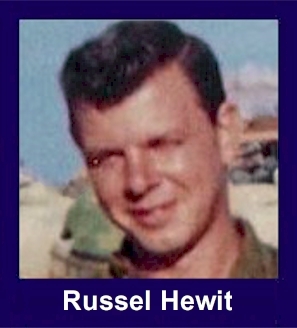 The 35th Infantry Regiment Association salutes our fallen brother, SP4 Russel Howard Hewit Jr., who died in the service of his country on January 21st, 1969 in Pleiku Province, Vietnam. The cause of death was listed as Small Arms/AW. At the time of his death Russel was 25 years of age. He was from Seville, Ohio. Russel is honored on the Vietnam Veterans Memorial at Panel 34W, Line 49. The decorations earned by SP4 Russel Howard Hewit Jr. include: the Combat Infantryman Badge, the Bronze Star with V, the Purple Heart, the National Defense Service Medal, the Vietnam Service Medal, the Vietnam Campaign Medal and the Vietnam Cross of Gallantry with Palm Unit Citation. For heroism in connection with military operations against an armed hostile force in the Republic of Vietnam. Specialist Four Hewit distinguished himself while serving as a Rifleman with Company D, 1/35th Infantry. On 21 January 1969, Specialist Four Hewit's company was operating in the dense jungle near Chu Pa Mountain when it was subjected to intense rocket, mortar, and small arms fire from well concealed enemy positions. The initial barrage of enemy fire separated the point element from the remainder of the company. Reacting immediately to the crucial situation, Specialist Four Hewit dashed through the hail of enemy fire to an exposed position where he could place accurate fire on the enemy. His heroic actions enabled the point element to return to safety but as he attempted to reach a position of safety, he was mortally wounded. Specialist Four Hewit's courageous acts, aggressiveness, and exemplary devotion to duty are in keeping with the highest traditions of the military service and reflect great credit upon himself, his unit, and the United States Army.